Are you all ready for some awesome pumpkin inspiration? Myself, along with 10 other talented bloggers joined together for another monthly challenge, with this month's theme being craft pumpkins. I was all over this idea since I try to make holiday decor that can last from year to year. 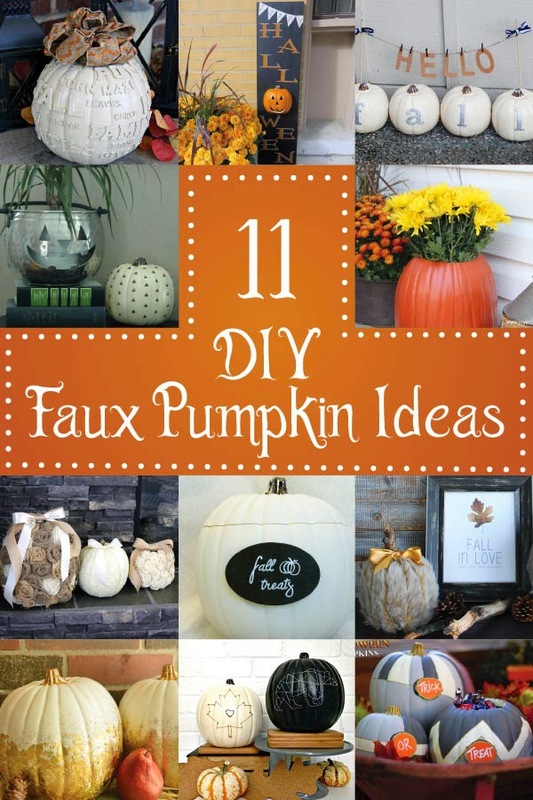 Who want's to spend a ton of money on real pumpkins when you can have a blast decorating faux ones? I'm a little cheap frugal, so in our house we go to the pumpkin patch and do all the fun mazes, slides, hayrides and feeding of farm animals, but you can believe my kids don't pick $15.00 pumpkins. We made that mistake one year and never again. They each get to pick a very small pumpkin, you know, the 3 for $1.00 ones. I then go and buy our large carving pumpkins for $4.99 at the grocery store. It's a win win situation! Alright, that's enough about my thrifty life. 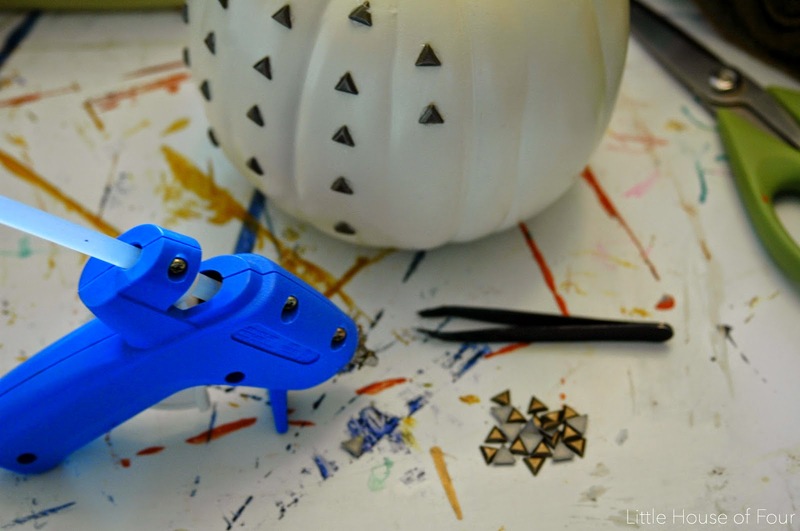 Let's talk about the 11 awesome pumpkins created using inexpensive craft pumpkins. We all had to purchase the same craft pumpkin from Michael's, but could purchase any size and color. I chose the 9' white pumpkin for my project. 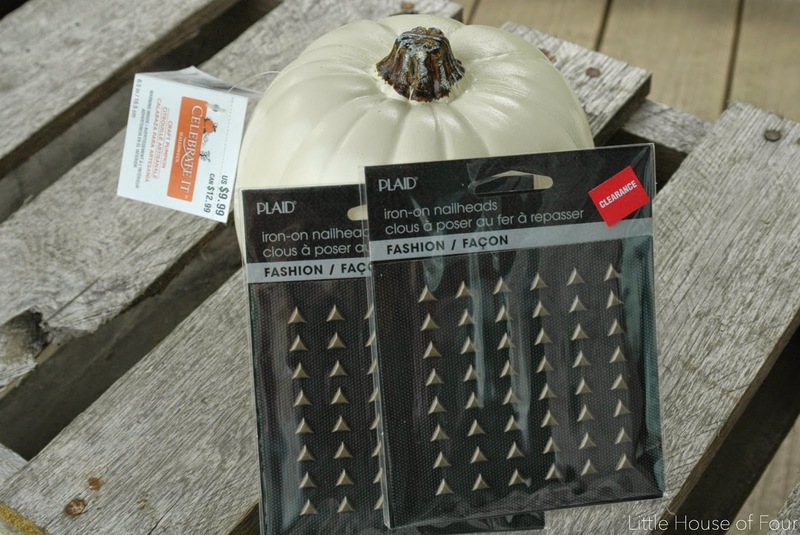 I also picked up 2 packs of triangle iron on nailheads that I found in the clearance aisle for $0.30 a piece. Total score. I peeled off the iron on nail heads from the black fabric they were attached to then hot glued each one onto a pumpkin. I learned real quick that I needed to use tweezers to avoid burning or glueing my fingers togethers. 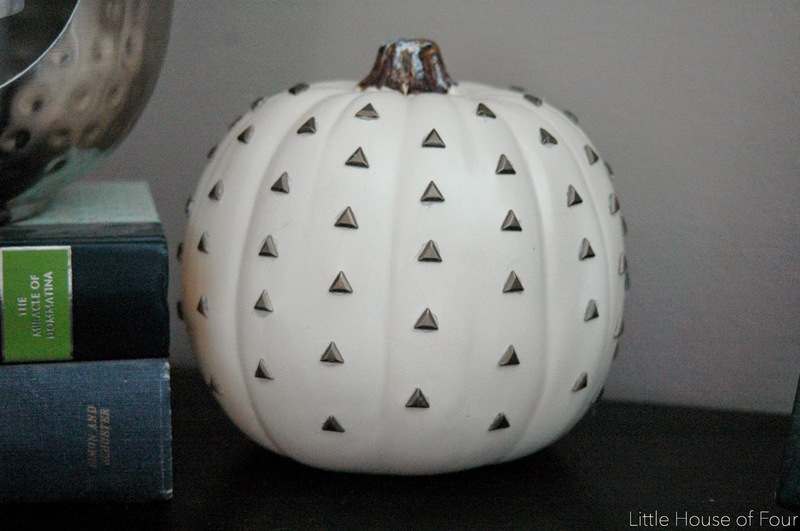 This fun little pumpkin blends in so well with my decor and I just love how it turned out. 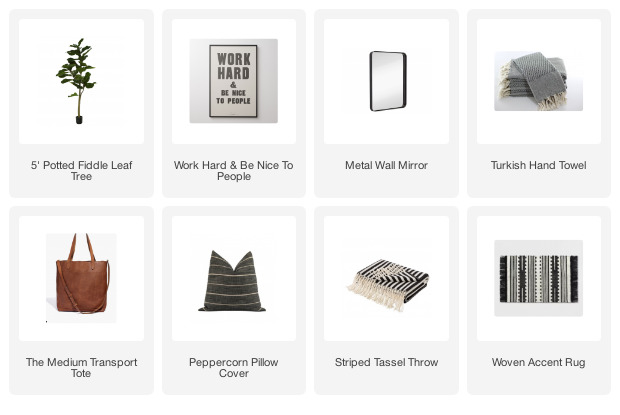 Now that you've seen my project, don't forget to click through the links and see what the other ladies have come up with. What a score on those studs!! So simple but so chic, I love it! This is so great! I love those studs - super modern with a touch of glam! I like how easy this one is to do - you rocked it! I LOVE it! I'm all about the geometric decor these days! (And what a fun hop idea, too!) Thanks for sharing! Thanks Valerie! I've been on a geometric kick too lately! I knew this pumpkin was yours before I even clicked on it! Love the little triangle studs!! Ha, is it that obvious, LOL!?!? This is so creative! 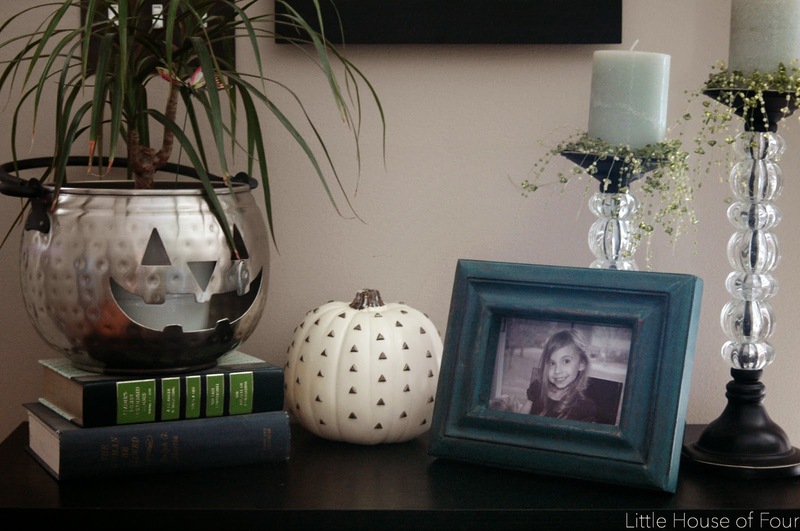 I really like the simplicity to your side table halloween decor, so nice! Your pumpkin is so "punk chic." I love it! I also love that you scored those studs for .30 - such a bargain!! Totally cute, Katie! I love it! Looks so chic. You did a really great job, thanks for the idea! 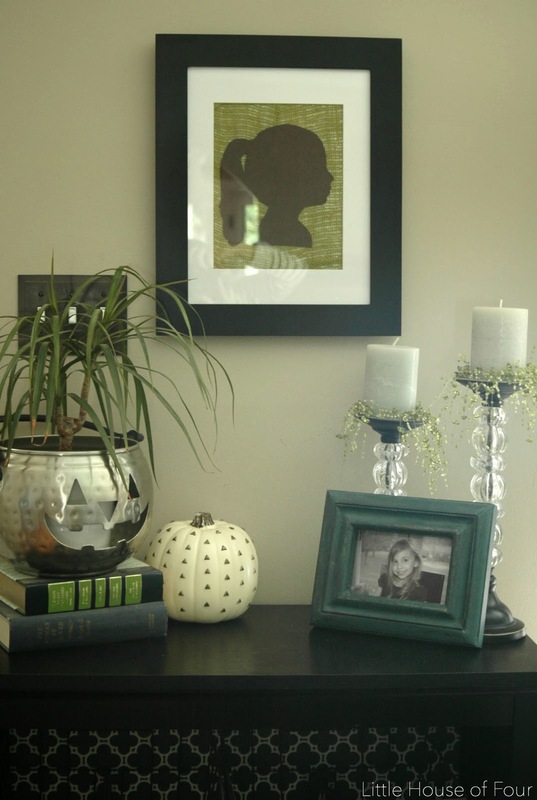 These are such fun pumpkin ideas! I love how punk chic your pumpkin is. And another favorite of mine is the Shabby Chic pumpkin! I love that pumpkin in the first picture! And the white one with the studs too! What a styling' looking pumpkin Katie!! So pretty!! This is awesome! So simple, yet so awesome! I love it! Lovin the studs!!!! And the little jack-o-lantern planter sitting next to it! Cute! 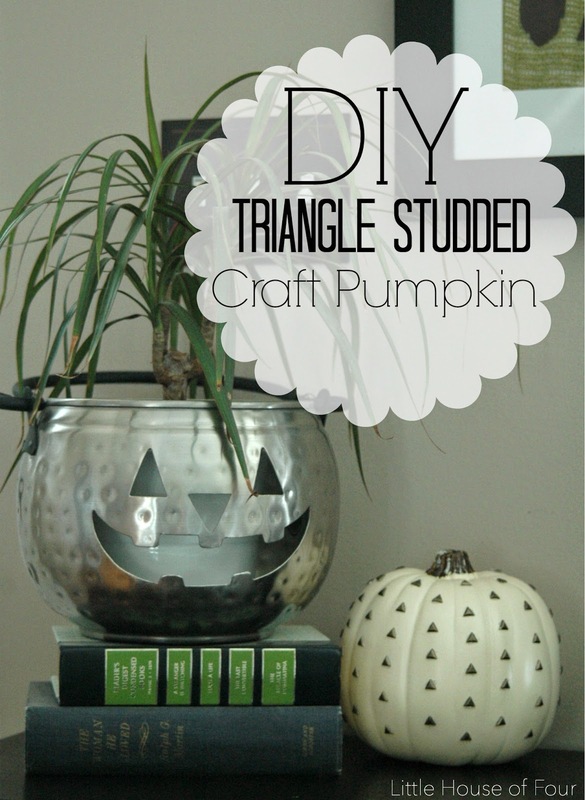 Such a stylish idea for a pumpkin! I love the metal jack o lantern bucket, too. The two pair very nicely together in your display. Thanks for linking up at Fridays Unfolded! 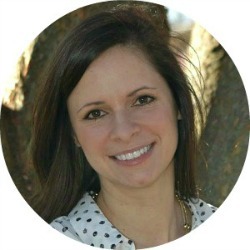 I'm sharing this on my blog as a feature! What a great idea to turn a boring pumpkin into a fun and blingy pumpkin!